Edison's work led to the first commercial power plant in 1882. The first steam turbine generator, pioneered by Curtis, was put into operation at the Newport Electric Corporation in Newport, Rhode Island. Although the health risks associated with asbestos had been long observed and were confirmed scientifically early in the Twentieth Century, it was not until the 1970s that the Australian community was made aware of the problem. Asbestos was phased out in Australia after 1980. It was finally banned from building products in 1989, though it remained in gaskets and brake linings until recently. Asbestos was prohibited completely after 31 December 2003, and can not be imported, used or recycled. Asbestos is a fibrous mineral that was widely used in Australia in the 20th Century for many industrial and domestic applications. Inhalation of asbestos fibres has been shown to lead to a number of serious health risks, including asbestosis and the cancer mesothelioma. As these can take a number of decades to develop, it is likely that the effects on the Australian community of exposure to asbestos will continue to increase into the 21st Century. Lead in domestic paint has declined from 50% before 1965, to 1% in 1965. In 1992, it was reduced to 0.25%, and in 1997 it was further reduced to 0.1%. On Catalyst: could lead exposure in childhood lead to an adult life marked by violent crime? "We've undertaken similar studies in Australia which show a very strong relationship between lead in air and crime 22 years later." 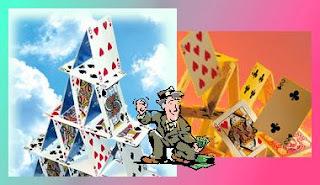 The U.S. Congress passed a law placing a prohibitively high tax on them in 1913. Sauria formulated a match using white phosphorus. However, the phosphorus was deadly. Many people developed a disorder known as 'phossy jaw'. Children who sucked on matches developed skeletal deformities. Phosphorus factory workers got bones diseases. One pack of matches contained enough phosphorus to kill a person. Deaths and suicides from eating the heads of matches became frequent. True horror story - A case of Phossy Jaw, in it’s worst stages. The infamous "phossy jaw" became an epidemic of exposed bone osteonecrosis exclusively in the jaws began around 1838. This epidemic of osteonecrosis produced pain, swelling, debilitation, and a reported mortality of 20% and was linked to "yellow phosphorous," the key ingredient in "strike-anywhere" matches. In match-making factories, workers called "mixers," "dippers," and "boxers" were exposed to heated fumes containing this compound. Related to the duration of exposure, many of these workers developed painful exposed bone in the mouth, whereas their office-based counterparts did not. Phossy jaw, also known as phosphorus necrosis of the jaw, was most commonly seen among match workers in the 19th and early 20th centuries – famously, the “London matchgirls,” whose strike of 1888 brought the problem into the public eye – fifty years after the first recorded case. In those days, matches were made with white phosphorus, and prolonged exposure to the vapor of the substance caused deposits to form in the victims’ jawbones. Throbbing toothaches, extreme swelling of the gums and abscesses in the jawbone followed. The afflicted bones would also take on a green-white tinge, while severe brain damage also lay in wait for those already suffering. The only known treatment was to surgically remove the jawbones; if it were left unchecked, organ failure and death would result. The disease also caused tremendous pain and disfigurement, and the rotting bone tissue emitted a putrid-smelling discharge. Phossy jaw did not begin to decline until 1906 – sixty eight years after the first recorded case. Finland prohibited the use of white phosphorus in 1872, followed by Denmark in 1874, France in 1897, Switzerland in 1898, and the Netherlands in 1901. Two French chemists, Henri Savene and Emile David Cahen, developed a safe match using phosphorus sesquisulfide that was patented in 1898. They proved that the substance was not poisonous, that it could be used in a "strike-anywhere" match, and that the match heads were not explosive. They patented a safety match composition in 1898 based on phosphorus sesquisulfide and potassium chlorate. An agreement, the Berne Convention, was reached at Bern, Switzerland, in September 1906, which banned the use of white phosphorus in matches. This required each country to pass laws prohibiting the use of white phosphorus in matches. Great Britain passed a law in 1908 prohibiting its use in matches after 31 December 1910. The United States did not pass a law to ban the manufacture and sale of white phosphorus matches, but instead Congress passed a law placing a prohibitively high tax on them in 1913. This punitive tax on white phosphorus-based matches was sufficiently so high as to render their manufacture financially impractical. India and Japan banned them in 1919; China followed, banning them in 1925 - five years before the centennial of the invention of white phosphorus matches. 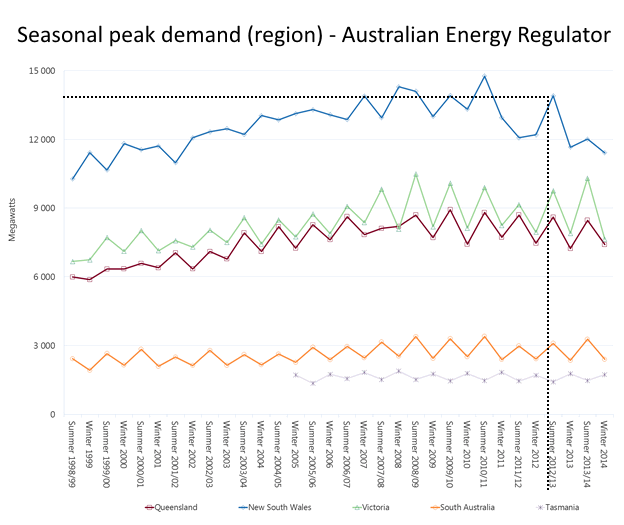 The Australian Energy Regulator processes data into a graph showing seasonal peak period demand in energy market regions. 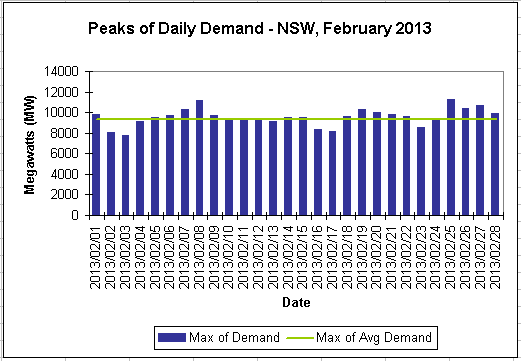 "A key plank of the Australian Government’s draft energy policy is to reform electricity pricing so that it more accurately reflects rises and falls in peak demand." 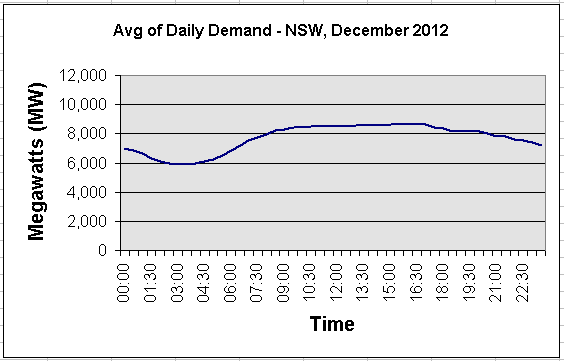 "But research we have published today suggests that this policy focus is missing other opportunities to shift electricity demand. 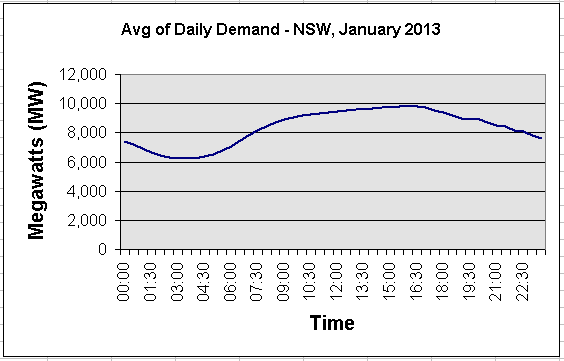 Research with parents reveals that many household routines are unlikely to shift in response to cost-reflective tariffs..."
When you drill down into the electricity demand data - summarised beyond recognition by the Australian Energy Regulator - you may well conclude that encouraging families to shift electricity demand is not only difficult. It is also pointless. 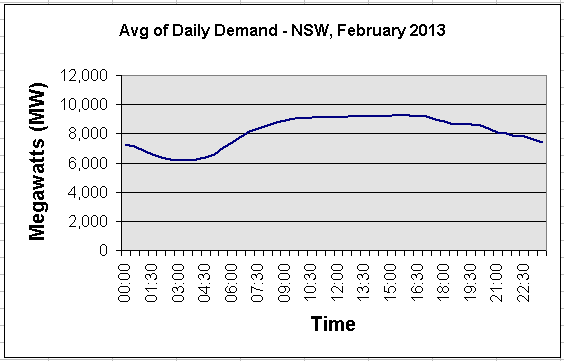 "Demand response allows energy users of all kinds to act as “virtual power plants,” adding stability to the grid by voluntarily lowering their demand for electricity. 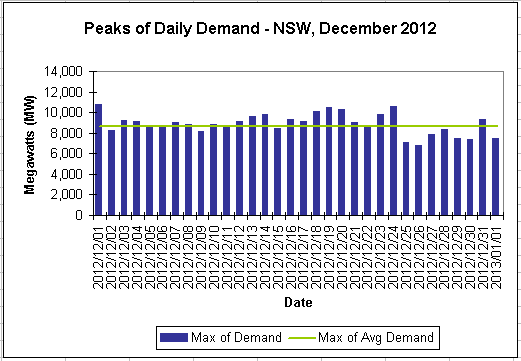 Participants in demand response programs get paid for providing demand response capacity..."
The "peak seasonal demand" for New South Wales in Summer 2012/2013 is shown by the Australian Energy Regulator to be about 14,000 megawatts (MW) during the peak 30 minute electricity market interval during December 2012 - February 2013. 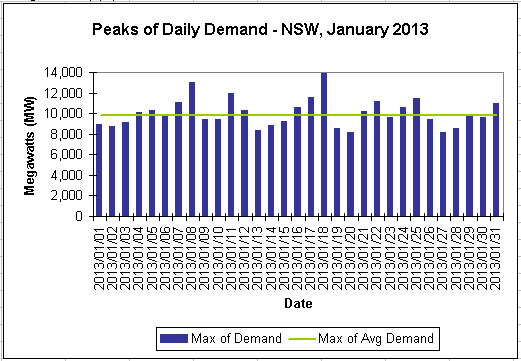 Graphing the source data from the Australian Energy Market Operator for this period shows that peak demand rarely went above 10,000 megawatts. Promoters of time-of-use charging may want to install generating and network capacity to supply 40 percent more electricity - 14,000 megawatts - for one to two hours each summer, and earn a profit from this grossly excessive capital investment. EnerNOC has got the right approach: pay a few electricity users to turn off discretionary plant and equipment for one or two hours each summer, and save the extravagant wasted investment.